Eucalyptus Radiata Essential Oil (Eucalyptus Radiata) - Sweetgrass&Rain Inc.
Eucalyptus Radiata is also known as Narrow-Leaved Peppermint. The young trees have oval bluish-green leaves while the mature trees develop long, narrow, yellowish leaves, creamy-white flowers and a smooth, pale grey bark. Eucalyptus leaves are the favourite food of Koalas, and have been used as traditional medicine by the aboriginal peoples of Australia. 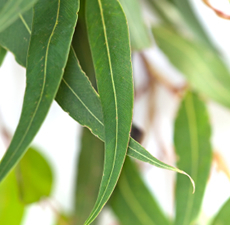 Eucalyptus Radiata Essential Oil has a crisp, clean, camphoraceous aroma with citrus and floral back notes.